CM Magazine:Frog or Prince? The Smart Girl's Guide to Boyfriends. Frog or Prince? The Smart Girl's Guide to Boyfriends. Lately, things have been getting really confusing. Stuff comes up that has nothing to do with what she and Ethan started fighting about. This stuff is actually a list of what Natalie hasn't been doing for him lately; the things she does do for him are never mentioned. Sometimes she just stares at him. She can't believe what she's hearing. What he's saying is not true, but she doesn't know exactly why. She worries that he's growing to know her by what she doesn't do for him, but then she throws her own list of his won't do's at him, too. The last time they had one of these ugly arguments, Natalie felt so messed up she had to back out of her promise to help with a birthday dinner for Meghan's dad, which was so not her! But Natalie felt that if she hadn't stayed to fix things up with Ethan, they wouldn't still be together. Vancouver author Kaycee Jane has written a book about finding the right guy. She provides several strategies and exercises to help women recognize what they want and need in a relationship. The filtering skills acquired in the Prince/Frog List can be used as a relationship evaluation tool, and the self-knowledge acquired by following the Setting the Bar exercise and completing the Get-To-Know-Yourself exercises will help women build and identify healthy relationships. Incorporated into this book are short relationship stories with dialogue. Readers follow along as Natalie, Meghan, Ella and Elizabeth try to find the Prince in their lives. 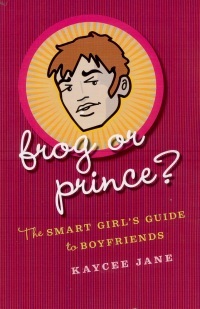 By Jane's providing examples of conversations in these relationships, readers will recognize if the men these women are dating are Princes or Frogs. Natalie tries to deal with invalidation in her relationship with Sean while Ella demonstrates how to get her needs met in a relationship. Many women will identify with the relationship stories and examples in this book as well as with the pain evident in the dialogue and the mistakes identified in the what went wrong sections. Although this book does provide examples of women maintaining their self-respect and making smart choices in their relationships, I found this book very difficult to read. The writing was disorganized at times, and this made the book seem lengthy and repetitive. In addition, I found the few swear words the author chose to use in this book were unnecessary and jarring in context. There are hundreds of relationship self-help books on the market, but this is not one I would recommend.